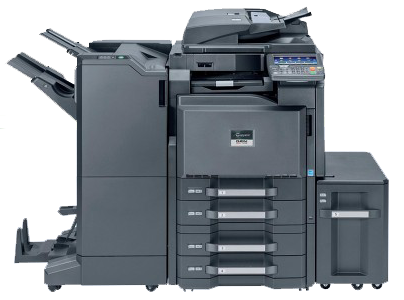 The Ricoh Aficio MP 6001 keeps large work groups productive and delivers superior performance. Offices can keep up with the demands of the Aficio MP 6001 output speed rated at 60 ppm. The user-friendly design and professional finishing capabilities will ensure professional results. The AFICIO MP 6001 keeps up with demands with output speeds of 60 ppm and first prints in as little as 4.2 seconds. The triple drawer paper handling on the AFICIO MP 6001 delivers estimated 4,200 sheets for longer print runs with minimal interruption to reload. The Aficio MP 6001 optional paper drawers and finishers will give offices the capability to complete more projects in the house with finishing touches. Choose between the Cost-Saving Compatible Ricoh MP 6001 black toner cartridge and the genuine Ricoh toner cartridge. The Aficio MP 6001 black toner cartridge (885400) will need replacing after an estimated 43,000 pages with 6% page coverage. Every day, your office generates a heavy document workflow. You know the value of a reliable partner, able to deal with a variety of tasks. Ricoh MP 6001 offers powerful solutions for your entire workflow. Copying, printing, scanning, faxing and finishing: all jobs are accomplished at high speed. Our reliable and easy-to-use systems are your formula for success. High productivity: 60 copies paper per month.